Strathdon Blue In the Highlands of Scotland in the small town of Tain, home of Glenmorangie Scotch, you will find the small Highland Fine Cheese company. 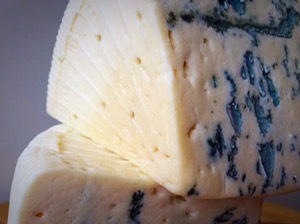 Strathdon Blue is their flagship blue cheese. Made from local pasteurised cow’s milk, and with a beautiful basket weave pattern on the soft, white rind, and large pockets of blue, it’s a truly splendid blue cheese to behold. Slightly salty, and creamy, with a blue broad flavor more like a Gorgonzola than the very direct Roquefort or St Agur, it’s definitely our favourite Scottish blue cheese. We have the Strathdon Blue accompanied with our house Oatcakes and fruit. Pair with a wee dram of Glenmorangie for perfection.